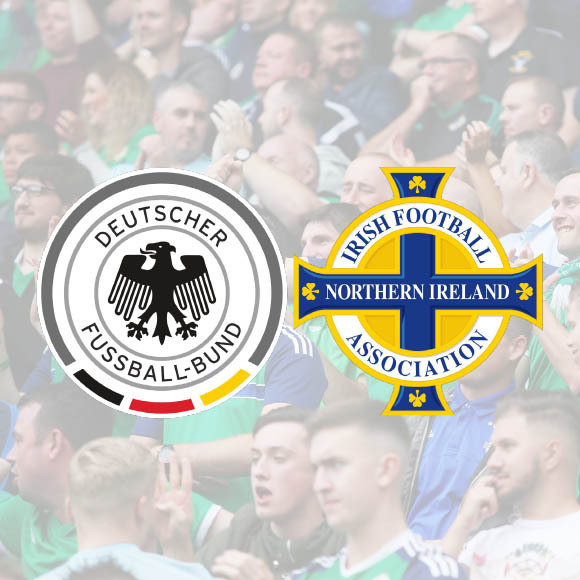 We’re going to Germany as Northern Ireland look to qualify for the Euro 2020 finals which take place across Europe. Day 1 – 18th: Direct early morning flight from Dublin to Frankfurt, arriving in the afternoon. Transfers from the airport to the hotel. Day 2 – 19th: Matchday. You are free to make your own way to the match and spend the day at your leisure. Day 3 – 20th: Transfer from the hotel to the airport to catch our mid-morning direct flight back to Dublin, arriving early afternoon. Return direct flights, a 3* hotel room with breakfast, and return airport transfers in Frankfurt. Full price: from £343 per person plus £4 per person booking fee. Single travellers or groups with odd numbers will have a single supplement charge of £75 for the rooms. Order of sales: Early Bird (from £299 – SOLD OUT) then Saver (from £319 – SOLD OUT), Full Price (from £343) and then On Demand dynamic pricing. Each category will progress after a certain number of bookings or date is reached, whichever is sooner. Book with £200 per person deposit until 30th April, with final payment due by 31st May. Booking fee is charged on both payments. From 1st May only full payment up front will be accepted for new bookings. Flight and hotel and room upgrades may be available on request and at an additional cost. Please note while the trip is now on sale we are still working to bring the price down. Everyone will pay the final price for each stage depending on which stage you booked in. So for example, if you booked today at the Early Bird rate and the price drops next week, you will pay the lower Early Bird price whether you booked with a deposit or paid in full. *Does Passenger 1 want to hear about future Northern Ireland news & trips? *Does Passenger 2 want to hear about future Northern Ireland news & trips? *Does Passenger 3 want to hear about future Northern Ireland news & trips? *Does Passenger 4 want to hear about future Northern Ireland news & trips? *Does Passenger 5 want to hear about future Northern Ireland news & trips? *Does Passenger 6 want to hear about future Northern Ireland news & trips? Standard air travel rules apply. No alcohol allowed on coaches and you can be refused travel if you attempt to bring any on board or are deemed too drunk to travel. Trips not suitable for large groups. Wonky Sheep Events is working with the United Kingdom Football Policing Unit to protect the safety of our supporters and you are required to supply passport details before you travel.